Many people ask me about a lawncare schedule, what to do & when; so I've created this easy guideline for you. How many times per year did you say you are going to fertilize your lawn? Once, twice, three times. No matter what you answer was now is the time to fertilize. Do it about 2 weeks before the ground freezes so that your grass has time to use that new food to grow big and strong before going into winter. Pick up or mulch in them leaves!! I see many people that do not pick up their leaves. They do not know how damaging to their lawn they really are. And yes I am talking about the layers of leaves that collect in some areas of your lawn, not the occasional leaf laying out in the middle of the lawn by itself. Have you made that final mowing yet? If your grass is more than a couple of inches long you answer should be no. Some people think that their lawn should be long going into winter. Just the opposite is true, keep mowing right up until the grass goes dormant. 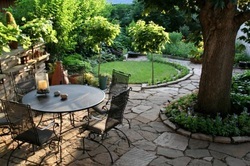 A welcoming front yard landscape is one of the most important factors in creating your home's unique personality. This is especially important when you're trying to sell your home. A few simple, inexpensive fixes can add zip and interest so prospective buyers will want to take a second look. Pick up all debris, toys, branches old pots/planters and everything else that doesn't belong in the front yard. Pull out all the tall weeds and dead plants in flower beds, planters and window boxes. Prune and trim any shrubs and plants to make them look neat throughout your landscape. Mow the lawn and edge the flower beds. Sweep the porch, steps, driveway and sidewalk. Spring is a great time to do some spring cleaning of the outside of your home. After a long winter, there are bound to be old leaves, untrimmed grass, and bares spots in your yard. After all, few people do yard work throughout the winter. Involve family and friends. 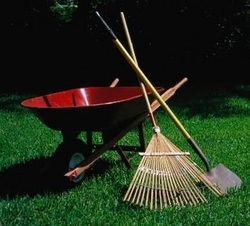 Cleaning up your yard is not always a fun task, since the winter months can take a significant toll. You'll have a lot more fun involving family and friends in your project. Clean up debris. 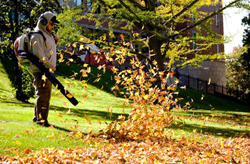 This includes limbs, leaves, trash and anything else that accumulated over the winter months. Cut back overgrown bushes and shrubs. Fall and winter have provided the perfect growing opportunity for bushes and shrubs in your yard, which is one of the main reasons why you need to trim them back.